Earlier this week, the National Park Service made their forecast and are now predicting that the Cherry Blossoms will reach their peak bloom April 3 – 8, 2010. 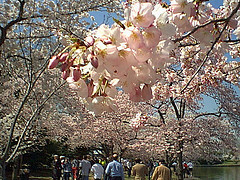 This is great news as the Cherry Blossom Festival is scheduled for March 27th – April 11, 2010. Free 3-hour ranger-led bike tours on the National Mall every Sunday from 1 – 4 p.m. departing from the Jefferson Memorial. Participants must provide their own bike, helmet and water. Ranger led discussions about the historical and natural significance of the cherry trees, on the hour at the Jefferson and Roosevelt memorials. Evening ranger-guided lantern walks – experience the cherry trees by soft light of a lantern during these two hour strolls. Daily performances at the Target performance stage at Sylvan Theatre including Japanese cultural groups and local acoustic musicians. Watch the Cherry Blossom Parade on Saturday, April 10th starting at 10 am as it heads down Constitution Avenue. Join 20 of Washington’s hottest chefs at the Pink Tie Party and enjoy cherry inspired dishes and cocktails – all for a good cause. If the crowds at the Tidal Basin overwhelm you, retreat to the Freer & Sackler Galleries at the Smithsonian to enjoy their collection of Asian art. They currently have an exhibit of Japanese ceramics on display. Stop by one of the local tea shops Teaism for a bento box and a refreshing cup of tea. Enjoy a cherry-inspired cocktail in the lounge at 14K. The Cherry Blossom Festival is a popular time to visit Washington, so we recommend making your reservations now. This entry was posted on March 5, 2010 at 4:52 pm and is filed under 14K, Family Fun Around Town, Outdoors. You can follow any responses to this entry through the RSS 2.0 feed. You can leave a response, or trackback from your own site.